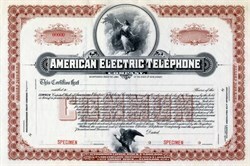 Beautiful specimen certificate from the American Electric Telephone Company printed around 1910. This historic document was printed by the American Banknote Company and has an ornate border around it with a vignette of an allegorical woman holding lightning in the clouds. Most all phones and phone parts used by Keystone were produced by the American Electric Telephone Company.